COMING SOON! 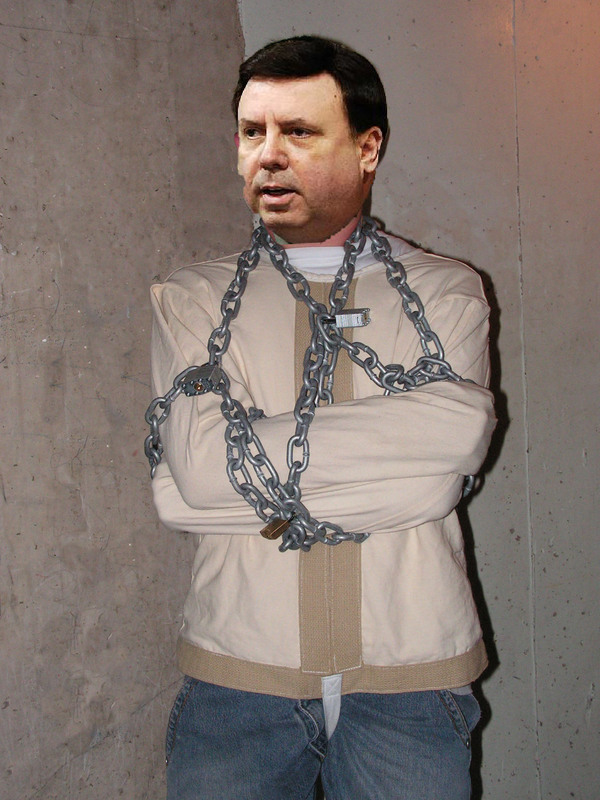 SARTO’S GESTAPO TACTICS! Sarto and his thugs, will be revealed in this hard hitting expose of the tactics and bullying of trustees and residents alike. You won’t want to miss this, as it will delve deep into the minds of deranged individuals. These thugs will do anything to scare, intimidate and harrass anyone who dares cross their path, including the families of those associated with them. Please sing along with our beloved Carpentersville Village President William Sarto! I’ve gone completely out of my mind.. And..
They’re coming to take me away, ha-haaa!! laughed and then you left, but now you know I’m utterly mad… And..
They’re coming to take me away, ho-ho, hee-hee, ha-haaa. They’re coming to take me away, ha-haaa. No, but I’m catching up, ha ha ha…. NEWS FLASH!!! Sarto’s life is endangered! As first reported right here on the Carpentersville Playhouse, hundreds of squirells have tried to scratch and chew their way into Village President Bill Sarto’s residence. Luckily for Mr. Sarto, children from around his neighborhood, chased the squirells away, when they were looking for marbles around his yard, after reports that Sarto had lost his marbles. Unfortunately, the children left, when none of them could find any marbles. 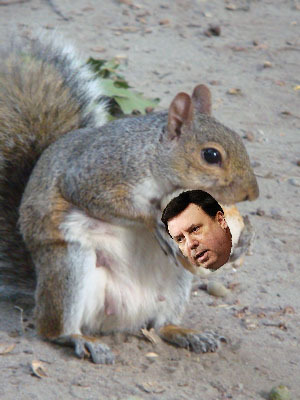 Today as Bill Sarto left his home through his front door, he was savagely attacked by a mutant squirell. Does King Sarto have the same infliction that England’s King George had? Is there reasons behind his madness? Is it alcohol related, drugs, dementia, or some other illness. Does he actually think he’s right and everyone else is wrong? 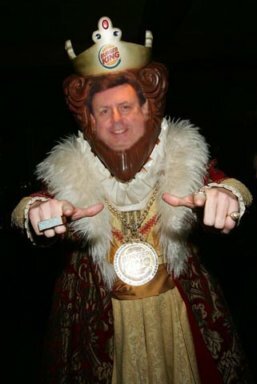 King Sarto has gone and thrown mud and insults to all the trustees [except Linda Remariz-Sliwinski], newspapers and anyone who dares questions his authority. He has developed a sense of superiority not seen, since Adolf Hitler’s days of the Third Reich. Hopefully, he won’t destroy Carpentersville, as Hitler did to Germany to get rid of him. This guy is on a mission to destroy everyone who dare opposes his will. It seems to many of us, that he’ll not only destroy himself, but the Village along with him. 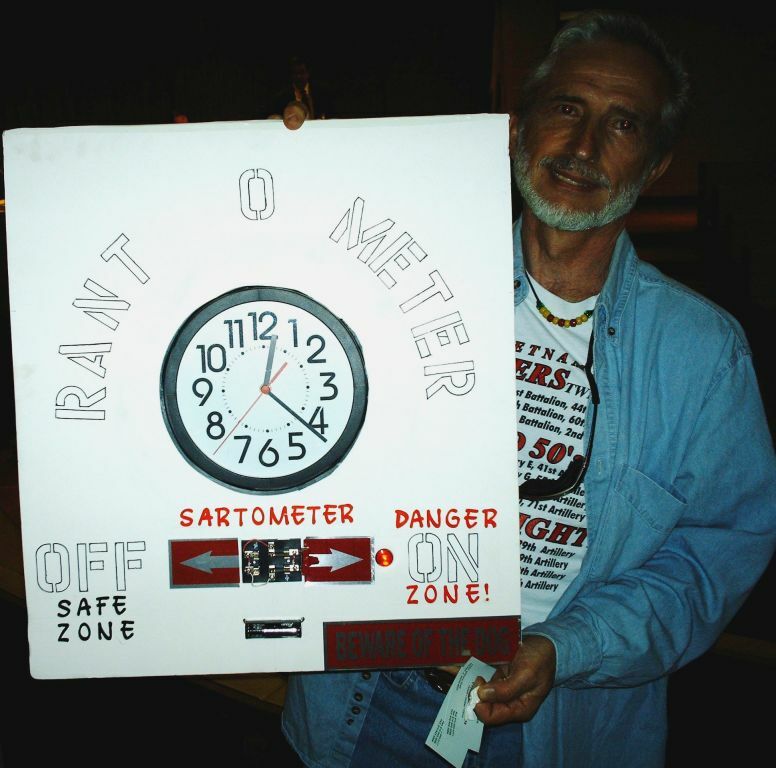 Clyde, who is pictured with his invention, the Rant-O-Meter, invented this gadget for public safety. As many of us, who have endured countless hours of ranting and ravings from our deranged President Bill Sarto. We have been experiencing dizziness, headaches and a severe pain in our….err, umm, well in the lower part of our body. Please be advised, to keep an eye on the Rant-O-Meter and if, it goes past ten minutes, please evacuate the room immediately!!! Thank God, we have the Rant-O-Meter for the good of Public Health! Children have scared off the squirrels! As reported earlier about the squirrel problem over at Bill Sarto’s house, the squirells have been scared off by a horde of children. Later as the kids left with empty hands, the squirrels returned in great numbers. Court Jester Nate Spain, staying or leaving? Looks like Nate Spain is still the Court Jester for King Sarto. He won’t officially resign from the Audit and Finance Commision, yet he says he won’t participate as long as trustee Paul Humpfer, remains as the Chairman of the Audit and Finance Commision. King Sarto says, that he won’t fill in this vacancy, hmmmmm. Nothing like looking after the best interests of Carpentersville.